A bruise occurs when you receive trauma to the skin. It results in pain and tenderness, and a visible discoloration to the area. They are very common, typically don’t represent an immediate danger, and will fade away on their own. Of course, most of us don’t want to look like we just fought a round with Mike Tyson and were lucky to escape with our ears. This is when it’s useful to know how to get rid of bruises fast. Fortunately, when you need to deal with muscle pain and bruising quickly, there are a few steps you can take to speed up the process. In order to make sense of the bruise healing process, you need to understand how a bruise forms and fades on its own. This will help you to take steps that can speed up the process. Immediately: This is the shock stage of the bruise. Your body is trying to flood the area with blood, to close any open wound and so the white blood cells can battle any infectious elements. Within a few hours: As it moves closer to the surface of the skin, the pooling blood turns the bruise a dark blue or purple color. Over a few days: Any pain in the area should be gone. 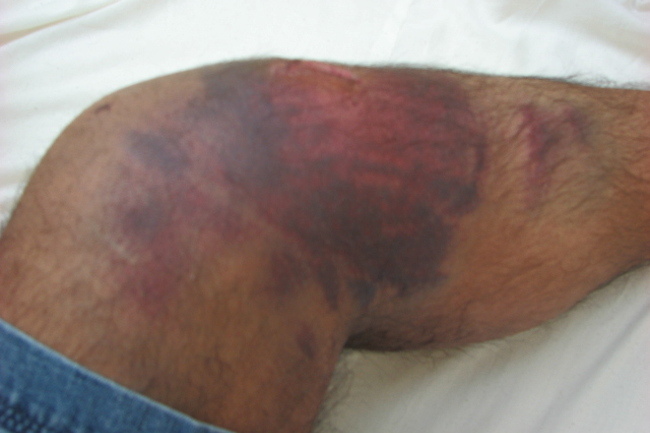 The color of the bruise will fade to a yellow or green color. After two weeks: The bruise should be completely gone, unless it was particularly large or intense. Healing bruises typically don’t have open wounds, so there isn’t usually much risk of infection. If left to their own devices, they will typically go away on their own. But you don’t necessarily have to present the bruise to the world for the entire time! Add ice: Immediately apply ice to the injury and continue to do so in 10-minute increments several times for the first day or two. This will help keep the blood from pooling in the area, reducing the presentation of the bruise. Elevation: Holding the injured area above the level of your heart also helps to keep the blood from pooling and reduces swelling. Compression: Wrapping the bruised area can help to prevent swelling and keep the blood from pooling so much. Due diligence: The best treatment for bruises is to avoid the injury in the first place. Be sure to use safety equipment, make sure that your living space has plenty of open space to move in without bumping, and avoid trying to navigate treacherous areas in the dark. Taking precautions like this will help you to stop the bruise before it has a chance to get established. Arnica: An ointment containing the herb arnica can help reduce swelling and inflammation, speeding the bruise healing time. Vitamin K: This vitamin helps with blood clotting and can reduce the healing time of a bruise. Apply a cream containing vitamin K directly to the twice per day. Aloe vera: Applying aloe vera to the bruised area can help to deal with the pain and inflammation of the bruise. Be sure that you’re using pure aloe vera. Many products have additional ingredients that won’t help with the healing process. Vitamin C: Whether you take a supplement or use a topical cream, vitamin C will reduce inflammation and speed the healing process. Pineapple: This fruit isn’t just for ham or Hawaiian pizza. It also contains bromelain, an enzyme that fights inflammation. You can eat the pineapple directly, or just use the bromelain in a supplement or cream. Comfrey: Used to treat ailments of the skin, comfrey can be applied as a cream to the bruise, or you can use a compress of comfrey leaves steeped in boiling water. These home remedies can help to reduce the healing time for your bruise. Generally speaking, a bruise isn’t a reason for excessive concern. It will typically fade away through a rainbow of colors, providing you with plenty of opportunities to show off to your friends. But there are a few situations where a bruise can indicate a bigger problem. These can be the signs of a more serious problem, and you should deal with it before it gets worse. Another reason to check with your doctor is when you bruise easily, though it is likely to be caused by external factors such as medications or smoking. When you need answers to medical questions like how to get rid of bruises, the qualified medical Experts on JustAnswer can provide clarification, offer suggestions, or even just set your mind at ease. Do you have a bruise treatment I missed? Share it in the comments!